Simon & Schuster Children's UK, 9781471120251, 288pp. Step right up! 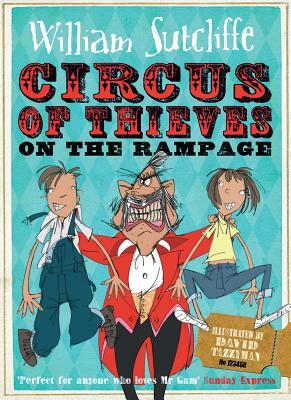 Shank’s Impossible Circus is back in town in this “utterly madcap adventure of sabotage and adventure” (The Guardian) from bestselling author William Sutcliffe. Filled with slapstick humor and clever word-play, this hilariously wacky and fun adventure is a must for fans of Andy Stanton, David Walliams, and Roald Dahl. William Sutcliffe is the bestselling author of numerous books, including the international hit Are You Experienced?. The Wall, his first YA novel was been shortlisted for the Guardian Fiction Prize and Carnegie Medal. Circus of Thieves is his series for younger children. He currently lives in Edinburgh. David Tazzyman grew up in Leicester, studied illustration at Manchester Metropolitan University, and then travelled around Asia for three years before moving to London in 1997. He likes football, cricket, biscuits, music, and drawing. He dislikes celery.